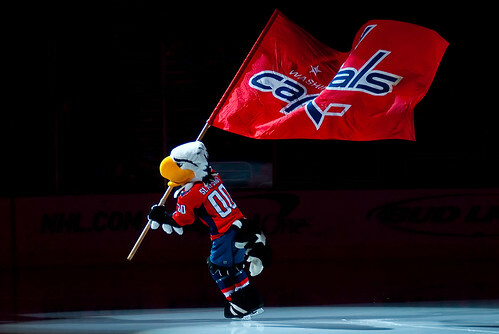 The Playoffs have returned to the Verizon Center’s Ice, and the Caps will be hosting the NY Rangers for the first round of the Stanley Cup. Thanks to the Caps’ 2nd place finish, they’ll have home-ice advantage down to the Conference finals, and perhaps then, depending on if first-seed Boston is still playing. Tickets go on sale shortly after the schedule’s set, with games probably starting as early as Saturday this week. The Caps finished the year against the Rangers at 3-1, losing the one game in a Shoot-out. The Rangers are 3-3 in their last two weeks of the season, with losses to Carolina and Boston. Two games remain for the Wizards. Two chances to get a win and beat out the 2000-2001 season’s awful record of 19-63. But, they’re facing #2 Boston, followed by Toronto. It’s a bit tough to see the guys going 21-61, but perhaps 20-62? Either way, an atrocious season for the Wizards, largely due to the absence of Agent 0, or perhaps a coaching deficit. Any way you look at this season, it’s fractally bad. Here’s hoping with a decent draft pick, and some off-season practice, they might be a halfway decent team come the Fall. That’s about all you can hope for, I’m afraid. Place: Last in the NL East. Where to begin. There’s not a lot for Nats fans to be happy about right now. Starting pitching can only be described as lackluster and the offense isn’t hitting on all cylinders. The Nats’ starting four has been pretty atrocious, and the team as a whole has an ERA of almost 8. If you only include the starters, that jumps to 11. Not stellar. Hard for any offense to beat that, which brings us to the Nats’ offense. There’s one stat more than any other that’s killing the Nats: 55 Runners Left on Base in the first six games of the season. The Nats have only scored 26 runs in those same games, which means that of the 81 runners on base, just 21 have made it home. That’s pretty atrocious. Putting hits and plays together is pretty crucial to the offense, and it’s just not happening as it stands. It’s not all bad, I suppose. The addition of Rob Dibble to the Nats’ TV broadcast team is absolutely welcome. Of the four games I’ve caught on MASN, he’s been absolutely excellent opposite the middling Bob Carpenter. I still prefer Slowes and the gang on the radio, but I think Dibble is the right direction for the club, and I wholly support him. There are tickets for today’s 3pm home opener against the Phillies if you want to play hooky. I looked on Friday, and you could still get 4 seats together just past third base in the lower deck, so, there’s probably still plenty of good seats left. A mixed bag for DC United, who picked up a win over the Houston Dynamo (1-0) and a loss to Real Salt Lake (1-2). Luciano Emilio came up big for United with an early goal against Houston, and the squad managed to outlast the Dynamo despite losing Captain Jaime Moreno to a red card with 15 minutes left in the match. Saturday’s matchup with RSL was less positive. Emilio came up with another goal for United early, but the offense of Salt Lake was not to be matched. United face off against the New England Revolution (booooo, hisssss) this Friday night at RFK. Tickets are still available, provided you don’t want to cheer for the Revolution. I had a drink with the prez of the wizards last night. he told me that lottery position really matters, but you can never tell a team to lose for that purpose. he really likes two players: griffin and rubio. he never once mentioned flip saunders (rumored by wapo today to be next coach).